SAT. (9/9/17): THE GRAND OPENING OF THE BJIOS TECH SHOP POWERED BY OPEN FORMAT LA & JESSE DEAN DESIGNS! 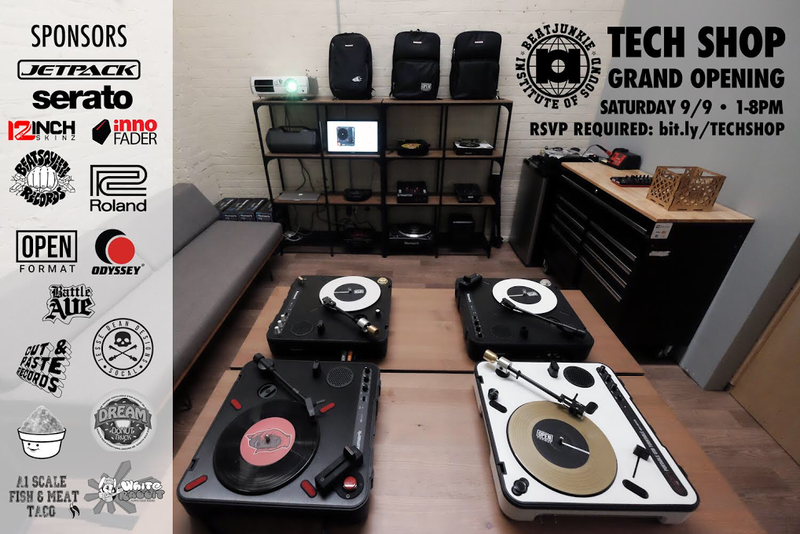 This Saturday (September 9th), we are proud to present the Grand Opening of our BJIOS Tech Shop, powered by Open Format LA & Jesse Dean Designs. These 2 entities are one of the leading companies that are helping building the ‘Portable Turntablist’ scene. Now we have them at the Beat Junkie Institute Of Sound to help out all your portable turntable needs, like custom made modifications, repairs, & merchandise. It’s going to be a big event with some giveaways as well as food trucks by White Rabbit, Dream Donut Truck, A1 Scale Fish & Meat Tacos, & many more. Thank you to the event sponsors: Serato, 12 Inch Skinz, Innofader, Battle Ave, Odyessy, Cut And Paste Records, Jason Markkk, & many more. The event is from 1-8pm and it’s FREE!! ALL DJS/TURNTABLISTS/PORTABLE TURNTABLISTS WELCOME!